Free speech and freedom of conscience have long been core American values. Yet a growing intolerance from the left side of the political spectrum is threatening Americans' ability to freely express beliefs without fear of retaliation. 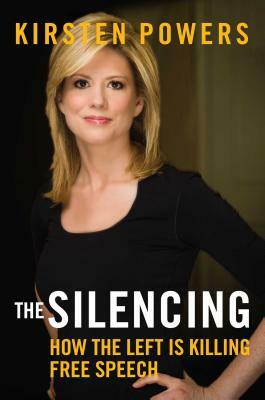 USA Today columnist and Fox News contributor Kirsten Powers calls it "The Silencing"
Powers chronicles this forced march toward conformity in an exposé of the illiberal tactics deployed to shut down debate on some of the most important issues of the day. How is it that liberalism, once associated with open-mindedness and reason, has become a vehicle for irrational prejudice, ideological conformity, and the marginalization of dissent? What is happening to free speech in America? Kirsten Powers is a Fox News contributor and columnist for USA Today. Powers has been called "Fox's liberal to be reckoned with" by Mediaite and "an outspoken liberal journalist" by the Columbia Journalism Review. The Women's Media Center lauded Powers as a "trailblazer," "powerful," and an "exceptional professional." Prior to her career in journalism, Powers worked in Democratic Party politics and the Clinton administration. She has been published in the Wall Street Journal, New York Observer, New York Post, The Daily Beast, Elle, Salon.com, and the American Prospect online. A native of Fairbanks, Alaska, and graduate of the University of Maryland at College Park, Powers currently resides in Washington, D.C.